This painting 'A North-East View of the House of Mr Emanuel Lousada, Kingston, Jamaica' was painted in 1778 by Samuel Felsted who was born in Jamaica in 1743. As reported by the National Gallery of Jamaica on 26 Apr 2017 the painting was just sold for US$80,000 by Freeman's, art auctioneer of Philadelphia. The owner of the house was Emanuel Baruh Lousada #135, a merchant and occasional plantation-owner (see right), and a legal authority in Jamaica, writing his own and many other wills. The National Gallery provided some notes on Emanuel (discussed in note 6 below). 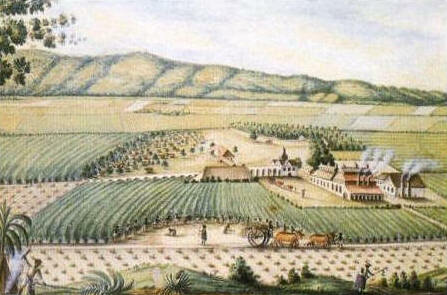 Watercolour painted around 1800 by John Henry Schroeter of the Richmond sugar estates in the Parish of Saint Ann, Jamaica. 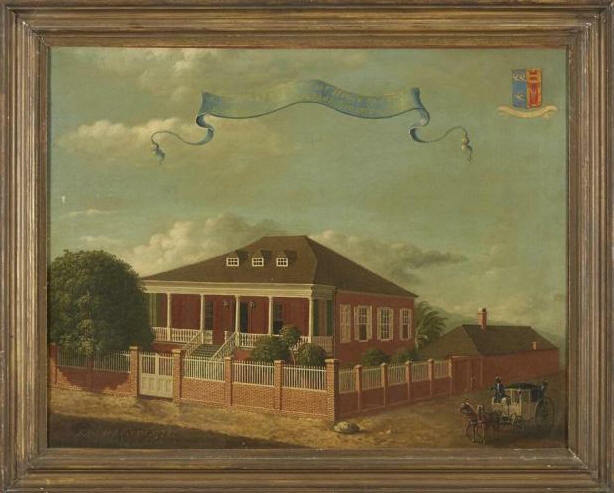 These were based on a Charles 2 land grant to a John Shelton in 1674, sold in 1784 to major creditor Emanuel Baruh Lousada (whose house is shown in the image to the left), a Jewish merchant of Kingston, who onsold them to Jacob Israel Bernal in 1788. The Jewish merchants were thus able to use their financial resources to gain from the fluctuations in the sugar markets. This image confronts us with the fact of slavery. Jamaica - 3rd largest island in the Caribbean and long-term Jewish haven; the Spanish effectively ignored the religious insincerity of the New Christians before 1655. Crypto-Jews were present from the days when Christopher Columbus and his family held the island (ref 6 suggests Columbus encouraged their presence as did his in-laws from the House of Braganza). After 1655 Jews were officially welcome though not greeted with much enthusiasm by local merchants who could not match their strong network of overseas associates and their knowledge of Portuguese and Spanish. Jamaica's sugar production surpassed that of Barbados in the 1720s though its sugar production was eventually exceeded by that of Cuba and Hispaniola. Jamaica was taken by England from Spain in 1655, but the conquest was somewhat unconvincing. English occupancy proved a messy affair and the slaves released by the departing Spanish settlers proved troublesome. In the end though, Jamaica became an economic success - in ref 117 can be found an extremely lucid account of the 3 components from which Jamaican economic surge was constructed - the enormously profitable contraband trade with the Spanish colonies in which the merchants received valuable consideration in the form of bullion, dyestuffs, exotic but fashionable foods and food additives; the growing sugar plantation business; and the profitable ancillary business of plantation financing and supply, shipping, insurance and sugar sales. This drew merchants from all over the Atlantic, some Jewish. An account of how some planters relocated from Barbados to Jamaica in the late 1600s can be found in ref 129, which also describes the impact of the buccaneers who were invited in for defensive purposes and who provided a stream of pirated goods. Some of the New Christians already in Jamaica in 1655 stayed on, having assisted the English with information, and they no doubt soon reverted to Judaism, though some of their compatriots eg those arriving from Barbados had already done this. Pre-English Jamaica no doubt hosted the Lousada ancestors reported to have been in Jamaica for 'many generations' - the identity of these ancestors can possibly be found in the Lamego family history - but whether they actually stayed on is not proven. Likewise we do not know what brought key ancestor Aaron Lamego (see below) to English Jamaica, but it is likely he came from a French colony eg Guadeloupe or Martinique perhaps via Saint Domingue. Despite its uncertain beginning from the English viewpoint, Jamaica became a key stepping stone in the history of the English Baruh Lousadas, for it is from there that they made their successful (second) passage to England. We have concurred with some of the authorities on a crucial point here - that Jacob #380 and Emanuel #41 came to Jamaica from Barbados (see note 4 below). We do not know exactly what linkages led to their move to Jamaica but it seems likely the Lamego family had something to do with it (see note 3 below). In Jamaica, Jacob #380 and Emanuel #41 married daughters of Aaron Lamego (respectively Abigail the elder and Esther) and had 5 children each. Of Jacob #380's offspring only his son Aaron #1174 and his unmarried daughters bore the Lousada name. Emanuel #41's son Jacob #36 married Abigail Lamego the younger in Bevis Marks in 1743. The main branch of the English family with the Lousada name was thus headed by Jacob #36 and the main Jamaican branch was headed by his brother Aaron #125 (see note 1 below). These family branches maintained contact through intermarriage. Aaron's 1st son Emanuel #135, the person connected to the images above, married his cousin Esther, daughter of Jacob #36, in 1763. They became the parents of Isaac the 1st Lousada Duke - who in 1807 married his cousin Lydia (formerly Leah) whose father Isaac #34 was the brother of his mother Esther #88. A further marriage between first cousins took place in 1836 when Lydia's nephew Isaac #68 married Sarah her daughter and this couple lived for a time at Sidmouth, the coastal town where Emanuel #87 (a son of Jacob #36) established Peak House. Aaron #125 is not mentioned in Aaron Lamego's will (probate 1747) as are his siblings Jacob, Rebecca, Abigail and Rachel (see also note 2 below). This omission probably meant that Aaron #125 inherited the business of Aaron Lamego - perhaps together with his brother-in-law Isaac Lamego, the father-in-law of Jacob #36 - and needed no further benefit in the will. Aaron #125 of Jamaica became an extremely wealthy plantation financier presumably building upon the inherited Lamego business. His son Emanuel #135 continued on these lines, but then owned for a time the Richmond sugar estates (see picture above and the further notes on it). The Carlisle and Banks estates also came into Lousada hands and were there at the time of abolition of slavery in 1834 (see note 5 below). Carlisle was in that part of the Parish of Vere which is now in Clarendon (the remainder of Vere is in Manchester) and Banks was in the Parish of St Ann. Some key details of the fate of these 2 plantations have emerged through study of slave-holder compensation records, and a summary may be found here. 1. Aaron #125 bore the name of both his paternal and maternal grandfathers. A similar comment can be made about Aaron #1174 the only known son of Jacob #380. Aaron #125 was born in 1706, married Rachel Mendes da Costa 1720-89, was an executor of the will of Isaac Mendes da Costa #1337 (his brother-in-law) that received probate in 1766, and he died in 1768 (ref 89). He is mentioned in his brother Jacob's will (probate 1752). 2. There is a related question as why the 5 children of Emanuel #41 are not mentioned in the will of their cousins Aaron #1174 (who died in 1768) and Leah #385 (who died in 1765), children of Jacob #380. This might suggest that Emanuel #41 and Jacob #380 were not brothers. Cousins however were not always mentioned in wills if there was separation and lack of knowledge as to whether the person was still alive. This was a real issue here as all of the 4 siblings of Aaron #125 were probably dead by 1765 - certainly Jacob #36 in 1752, Rachel in 1754, Abigail in 1745 while Rebecca seemed to have no children after 1749 (though appeared in Jacob's will which was proven in 1752) - and perhaps it would have been natural to assume that Aaron #125 was dead as well. This assumption would not have been far wrong, for these 2 Aarons died in the same year - 1768 - as did their cousin Aaron #714 of Barbados! 3. Perhaps a clue lies in their mother's name of (Rachel) Gomez Henriques which suggests early Lamego ancestry, and in any case there was an indirect link between the Baruch Lousadas and the Rouen Lamegos via the Levi Montezinos family. The Curiel/Acosta in-laws of the Lamegos were present in both Barbados and Jamaica and may have provided an additional link, as they may also have provided a link which drew Aaron Lamego to Jamaica from a French colony (Saint Domingue seems the most likely) a generation earlier. However Hannah and Esther, sisters of Jacob and Emanuel, lived married lives in Jamaica. Alvin and Touro were their respective married names - names which can be found in Curacao so perhaps the Barbados Baruh Lousada links with Curacao dating to 1685 if not earlier were also relevant. Her mother's 1703 will shows that Esther married before 1703 and hence before Hannah, and thus Esther may have led her 3 siblings - Jacob, Emanuel and Hannah - to Jamaica. Esther's Touro family had an interesting link with Amsterdam and Newport, Rhode Island. 4. This was probably around 1705. Jacob and Emanuel were the 2 youngest sons of Aaron Baruh Lousada #376 of Barbados and were born there in 1681 and 1682 respectively (ref 5). Jacob appears to have had a first wife Leah in Barbados, but she died in 1702 and there were no offspring recorded in his mother's 1703 will. 5. Some details of the Lousada plantations have emerged from the current (2015) studies of the legacies of British slave ownership (see ref 165). 6. On 31 Oct 2017, the following notes were found on https://nationalgalleryofjamaica.wordpress.com/tag/samuel-felsted/ - 'Emanuel Baruh Lousada (1740-1797 or 1807) was a prominent Jewish merchant, land owner and trader in Kingston with family business connections throughout the West Indies and London. Lousada married an English cousin, Esther Lousada, who died in 1775, and later his brother Daniel’s widow, Rachel. The Lousadas traced their ancestry to Granada, Spain and frequently used a Coat-of-Arms as seen in this painting'. We have little quarrel with the comments on the coat of arms for it imports an element of the coat of arms obtained by his cousin Emanuel #87 - the 3 doves - which also appear in the coat of arms of the Duque de Losada whose title was assumed by 5 descendants of Emanuel #135. But our research gives no basis for a Granada origin of the Lousadas, but rather that they spent 2 or 3 generations in Portugal, where Lousada towns and villages occur (such names also occur in Galicia in northwest Spain - Granada is in the southeast); of course while most Portuguese Jews had a Spanish origin, we have found no evidence supporting any particular region of Spain. Emanuel married his London cousin Esther #88 in 1763, but we have no evidence that she died in 1775 and that he married his brother Daniels' widow Rachel or indeed that Daniel had such a wife. Rather, our research has found that Daniel married his cousin Rachel (Esther's sister) in 1765, and that after she died in 1768 married a further sister Rebecca in 1769 who after Daniel died in the same year went on to marry David d'Aguilar in 1771 a few months before her brother Isaac #34 married David's sister Judith on 6 Mar 1771. Click here for a chart of this amazing chain of marriages. Our research also suggests Esther died in London in Feb 1818. The 1st daughter of Isaac #92, Emanuel's youngest son, was Emma 1810-94 #97, whose name reflected the name of her paternal grandmother Esther #88, bearing in mind her father's conversion to Christianity and her Christian marriage. Emanuel died on 10 Sep 1797, but confusion has arisen about his death date because probate took so long to occur eg see here where 1807 is given as in the Gallery notes. His will-writing expertise may have been tested in his own case, for 4 codicils were required, though we have yet to discover why probate was so long delayed.